Here are 4 free Windows 8 apps to book hotels provides complete information on hotels; their location, hotel bookings, and more. Expedia is a free Windows 8 app to book hotels. 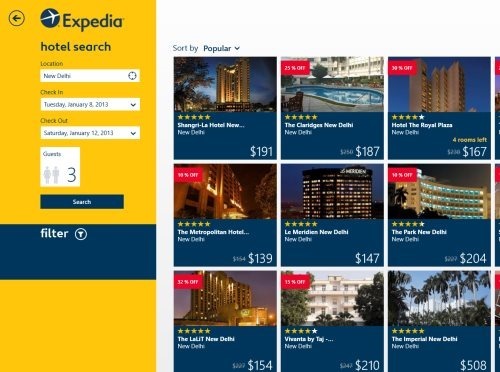 Here, in this Windows 8 Expedia app you can easily find hotels, get price details, accommodation status along with the discounts (if any). You can also read hotel reviews from various Expedia travellers, get access to your hotel itineraries, get best price guarantee, book hotels in less than a minute. You can also find map of the hotel location. In addition, you can also filter hotels by popularity, star-rating, and pricing. You can also find your favorite hotel by filtering hotels, get 5-star luxurious accommodation or low-cost rooms. Once you have booked a hotel, you will get an instant confirmation of you hotel booking along with the itinerary. Now, in order to check your hotel bookings, you need to sign in to your Expedia account, from within the app. To find hotels, all you need to do is just fill-in the details such as the location, Check In date, Check Out date, number of people, and the like. Click on ‘Search’ button once you are done with this and you will immediately get thumbnails of all the hotels along with the pricing and the discount price (only if any). You can also see the photos of the hotels that you are planning to book, get info about rooms and rates, reviews, and so on. Go ahead and download Expedia in Windows 8 now. KAYAK Flights & Hotels is another powerful booking Windows 8 app where you can, not only find hotels but also you can search for right flights and book them instantly, from within the app. 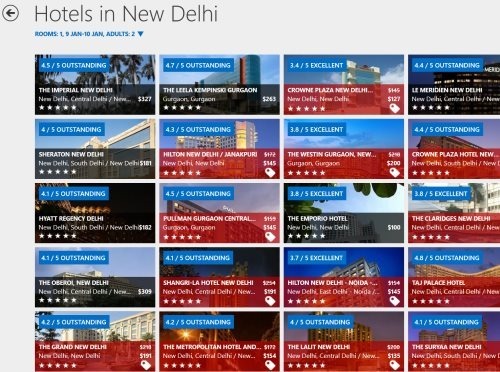 This Windows 8 app to book hotels and flights shows the pricing, photos, hotels category (5 Stars, 4 Stars, 3 Stars, 2 Stars, and 1 Star), read a brief description of each hotel, check out the reviews of all the hotels, and much more. As you open the app, you will find two different sections for finding Flights and Hotels. All you need to do is just fill the details for finding Flights or Hotels. You can also see photos of the hotels for better understanding. You can also filter flights by pricing, airlines, and time. So, move a head and download KAYAK Flights & Hotels app in Windows 8 now. 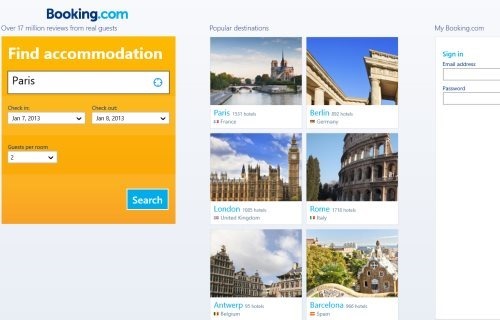 Booking.com is a free Windows 8 hotel booking app that lets you find a luxury accommodation in any area, covering the globe. This hotel booking Windows 8 app gets you over 240,000 places to stay in with more than 41,000 destinations, around the world. It’s very fast to search for a hotel and extremely secure to book, via Booking.com Windows 8 app. In addition, you can also read the reviews about all the hotels, posted by the guests of booking.com. You can check out the photos of each hotel, for better selection of hotel. It also facilitates you with options such as Star-rating, price range, hotel type, facilities, review score, and sort. To get all these options, you need to right-click anywhere on the screen. Go ahead and download Booking.com app in Windows 8 now. Ending my post with Hotels.com that lets you find hotels from a collection of over 150,000 hotels in 200 countries. You can easily access over 20,000 last-minute deals, filter hotels by pricing, star-rating, names, and deals. Also, you can view map, photos of the hotel rooms, find phone reservations, read guest reviews, etc. 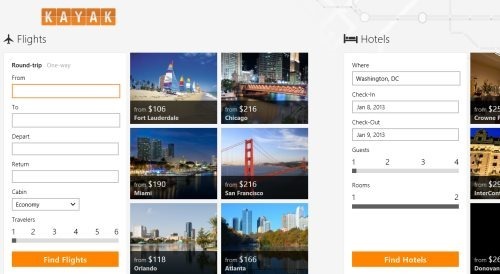 It’s a good utility Windows 8 hotel booking app which available under the ‘Travel’ section for free. Go ahead and download Hotels.com in Windows 8 now.